Use a mixture of both fresh and dried mushrooms. Put a good handful of dried mushrooms in a bowl with warm water to re-hydrate them. Slice the fresh mushrooms and gently cook them in a pan with a little olive oil, 2-3 cloves of crushed garlic and a sprig of thyme. Add a little of the mushroom water from the bowl while they cook. Season well. When the dried mushrooms are moist and plump enough, add them to the pan. Turn up the heat and cook for 2-3 minutes adding more mushroom water so that the mixture isn’t dry. Cook fresh or frozen peas till just done. Drain and mash them roughly and add finely chopped mint. While those are cooking, brush slices of good quality crusty bread with olive oil and grill on the barbecue or hot plate till golden. Rub with a peeled clove of garlic. 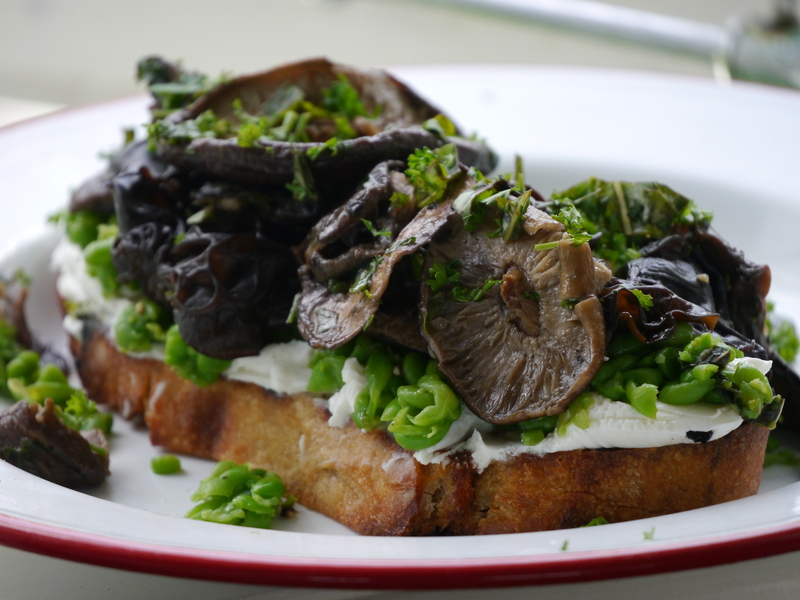 Smother the toast with plenty of goats cheese, add some crushed peas and finally top with the mushrooms. Garnish with chopped fresh herbs. If you’re really hungry add a poached egg as well.